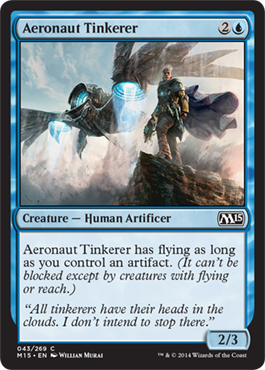 Eric's Review - Aeronaut Tinkerer is one of the cards in the "artifacts matter" subtheme of M15. Already a 2/3 for three mana, artifacts giving it flying is a good boost. Bottom Line: This could definitely fit in a Standard deck, likely usable in Limited, and possibly in budget builds of Affinity in Modern. 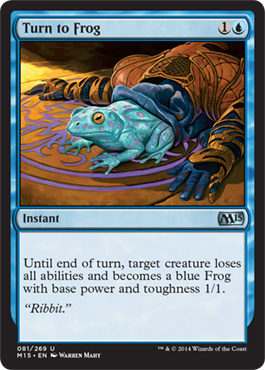 Eric's Review - This is great removal for blue as it gives an opponent the choice of likely not seeing certain creatures again or seeing them instead of other, more useful cards. 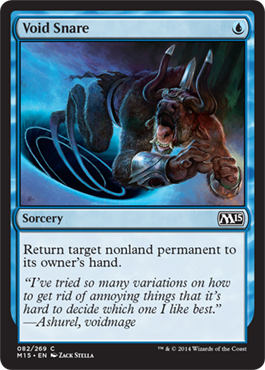 Bottom Line: Likely to be sported in control decks in Standard, possibly in Modern too. Very strong for Limited as well. Eric's Review - A four mana 3/2 that can also make other creatures unblockable. 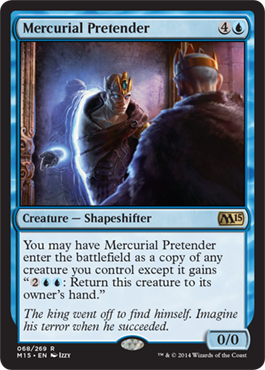 Bottom Line: Powerful in Limited, probably won't see play in Standard, good in EDH. Eric's Review - A three mana 1/1 that gets boosted every time you draw a card. This can be powerful when tied with spells like Divination. 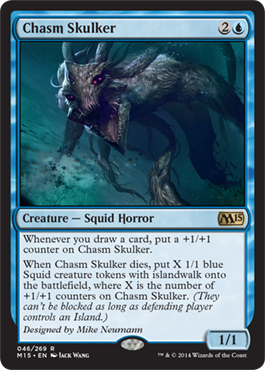 The best part is once this creature dies, you get tokens with islandwalk for each counter on Chasm Skulker. 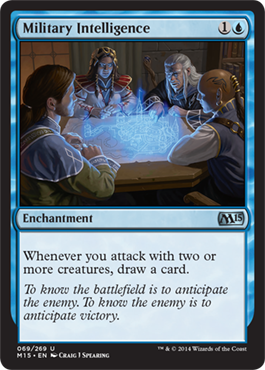 Bottom Line: Powerful for Standard, possibly strong in Limited, very powerful for EDH. Eric's Review - A card for a Standard Affinity deck, for only two mana, all artifacts you own have Convoke. On top of that, it is a 1/3 creature. 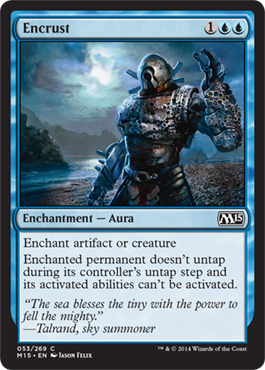 Bottom Line: Good for Standard, likely good in Limited if you get plenty of artifacts, definitely good in some EDH decks. Eric's Review - This is really a terrible card... Six mana to tuck a creature as the second card in its owner's library especially when other, better spells exist. These spells may not exist in Standard, but this is more of an EDH spell. 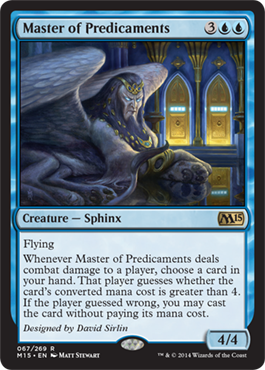 Bottom Line: This may be for an EDH deck, but for pretty much everything else this is too costly for what it does. 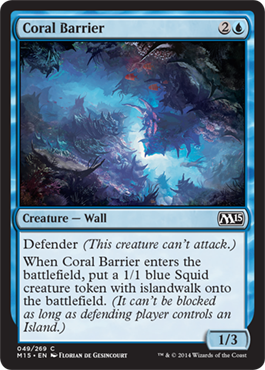 Eric's Review - A 1/3 wall for three mana that puts 1/1 squid tokens with islandwalk into play when it enters the battlefield. 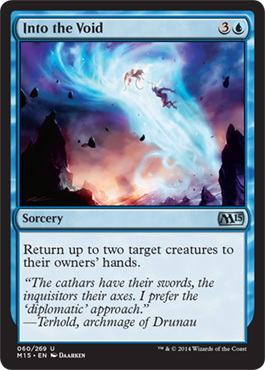 Bottom Line: Good for Limited, possibly in Standard, possibly good in EDH. 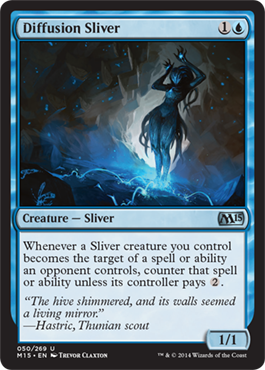 Eric's Review - A two mana 1/1 Sliver that allows all your slivers to counter any spell that targets them unless the caster pays two additional mana. Bottom Line: Goes into my Sliver EDH deck and will definitely fit into any deck with Slivers. 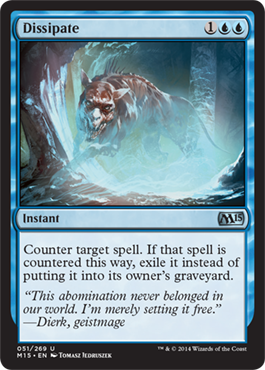 Eric's Review - A favorite from Innistrad, a three mana counterspell that exiles the spell that gets countered. 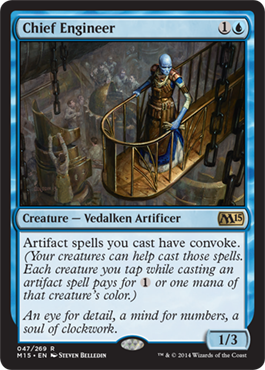 Eric's Review - Divination will be useful for Chasm Skulker as it puts two counters on it. Always good whenever it is played. Bottom Line: Good in Limited, Standard, and EDH. Not the best for Modern, but still a decent card. Eric's Review - A spell that prevents an artifact or creature from untapping or activating any abilities. 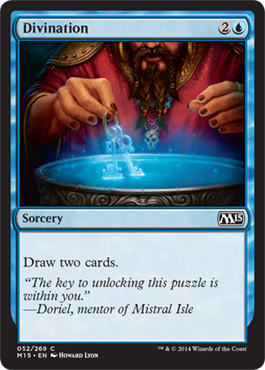 Bottom Line: Good in Limited, possibly in Standard with the artifact subtheme. 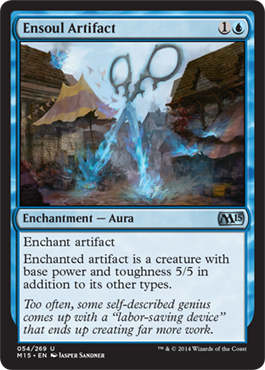 Eric's Review - A two mana enchantment that turns any artifact into a 5/5 creature. This is very powerful and will most likely see play. Bottom Line: This will be really powerful in Standard and could be really powerful in Limited. This could also see play in Modern Affinity decks. 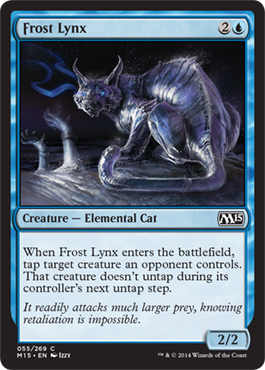 Eric's Review - A 2/2 creature for three mana that can lock down another creature for as long as Frost Lynx is on the battlefield. Bottom Line: Good in Limited, good in Standard, and likely good in EDH. Eric's Review - A vanilla 1/1 for one mana. Perhaps being a Wizard has some bearing on Khans of Tarkir. Bottom Line: It is good for Limited, and could quite possibly be good for Standard, but it may be a few months before its potential is realized. Eric's Review - This is a pretty interesting creature. For six mana, you have a 5/5 with trample and it requires a Mountain on the battlefield in order to attack. Bottom Line: This could be good in Limited and definitely could see play in Standard. Eric's Review - A reprint that can be useful in control decks. Bottom Line: Good for Limited, decent in Standard. 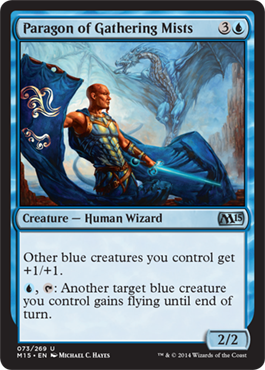 Eric's Review - A powerful creature especially with cards like Ornithopter in Standard. It is definitely powerful for three mana but it does have its requirements. 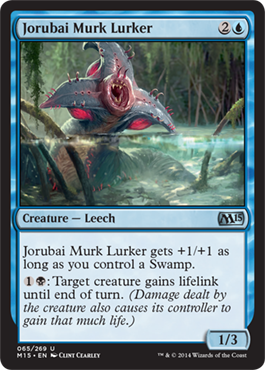 Bottom Line: This is a strong creature for its cost and would be great in Standard, Limited, and EDH. Eric's Review - Four mana to return to creatures is not a bad card. 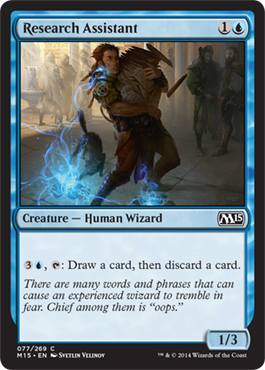 Bottom Line: This is great in Limited and EDH, and is good in Standard control decks. 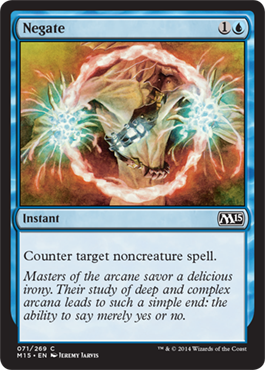 Eric's Review - Aqueous Form is a much better card from the beginning as it can't be blocked and allows for scrying while this one has double the mana cost and can be blocked by walls. Bottom Line: A decent card for any type of unblockable deck, it will likely see play in Limited, but I doubt it will become a good card in Standard. It could also be found in EDH too. Eric's Review - The second Planeswalker to review for this set, Jace returns in his fifth version. A planeswalker with five loyalty for four mana is already pretty good, but the abilities matter a lot too. The +1 ability lets you look at the top two cards of your library, put one into your graveyard. Sure it doesn't let you put it back in any order, but it does let you weed out cards you don't need like too many lands. The -3 ability lets you send anything that isn't a land back to your opponent's hand which is also good. 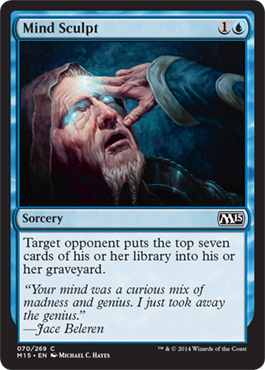 The -8 ability allows everyone to shuffle their graveyards into into their library and then for you to draw seven cards. This works through the ditching cards from the +1 ability. 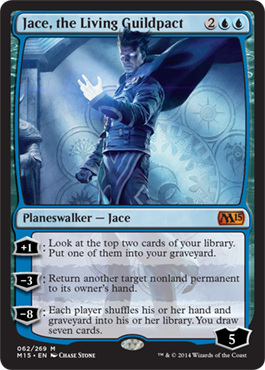 Bottom Line: This Jace is pretty powerful and likely to be found in any Super Friends deck in Standard or any other format. Planeswalkers are always good in Limited, and of course EDH. Eric's Review - A powerful card last printed in the jace vs. Vraska Duel Deck and originally printed in M11, this card is just a simple card draw spell. For two more mana you get to traw one more card than Divination. Bottom Line: It's a good card, but too costly for some formats. Definitely a Limited card, not such a great card for Standard. Eric's Review - Our second legendary creature of the set, Jalira is a 2/2 for four mana that can be used to sacrificed another creature and begin revealing creatures until a nonlegendary creature is revealed, and then it is put into play. This is a pretty powerful creature. Bottom Line: Strong for EDH, quite possibly powerful enough for Standard and possibly good for Limited if paired with tokens. 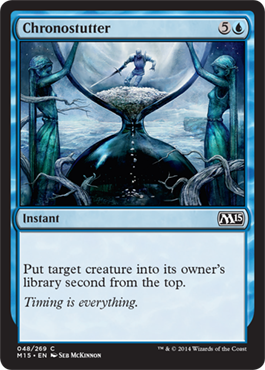 Eric's Review - The second spell in the new Kird Ape cycle, it is essentially a 2/4 for three mana and can give creatures lifelink. Definitely a good card. Bottom Line: Useful in Limited and Standard. Might be useful in EDH. 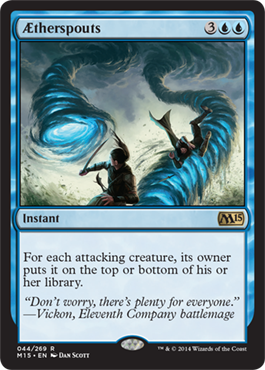 Eric's Review - A six mana 3/3 is normally not great, but it has flying and when it enters, it taps a creature you control and all other creatures that enter the battlefield tap creatures as well. Bottom Line: This is more of a card for Limited than anything else and possibly for EDH. Eric's Review - A 4/4 with flying for five mana that when it deals combat damage to a player, you can chose a card in your hand and cast it without paying its mana cost if an opponent guesses wrong. This is actually a pretty great card as you have a 50/50 chance that you can cast it. Bottom Line: Good for Limited, Standard, and EDH. Eric's Review - A five mana creature that copies another one on the battlefield along with the ability to bounce it back to your hand. 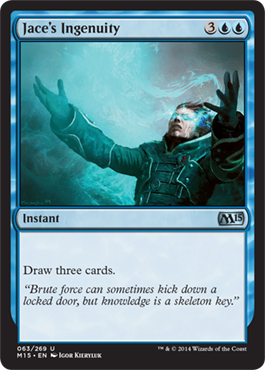 Bottom Line: Great for any format where Clone is already used, so this will be good in Limited, Standard, possibly Modern, and EDH. 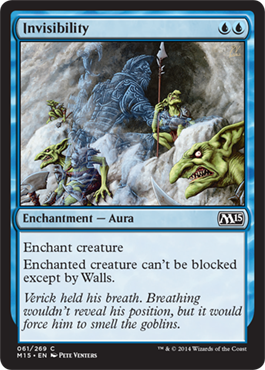 Eric's Review - This is a great enchantment which when you attack with multiple creatures, you get to draw cards. Bottom Line: Great for Limited, Standard, EDH, and possibly Modern. Eric's Review - Always a great milling card. Not to be paired with Jace, the Living Guildpact though. Bottom Line: Amazing in Limited, great in Standard and Modern, not too great in EDH. 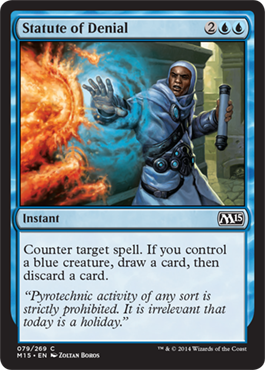 Eric's Review - A standard counterspell in recent days for noncreature spells. 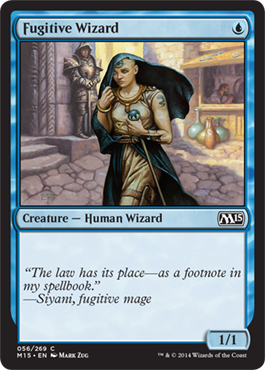 Bottom Line: A staple for any control deck, but strong in Limited. 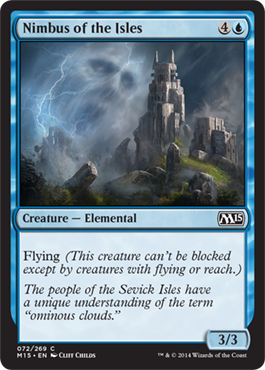 Eric's Review - A flying 3/3 for five mana is not too bad, but there are other options available that could be considered "better." Bottom Line: A card best suited for Limited. 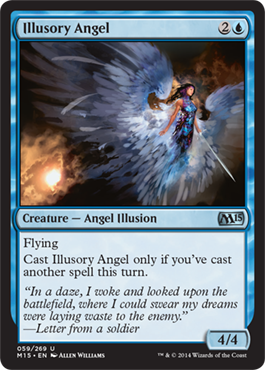 Eric's Review - The second in the Paragon cycle, as with the last one, it is a 2/2 for four mana that gives other blue creatures +1/+1. It can also give another creature flying until end of turn. Bottom Line: Good in Limited and likely good in Standard. Also powerful in EDH. Eric's Review - Peel from Reality, last seen in Avacyn Restored, while not too great given that you have to return one of your own creatures at the same time as an opponent's creature, there are still creatures with an "Enter The Battlefield" effect that can be reused. Bottom Line: Could be good in Standard, not bad in Limited, could be good in EDH. 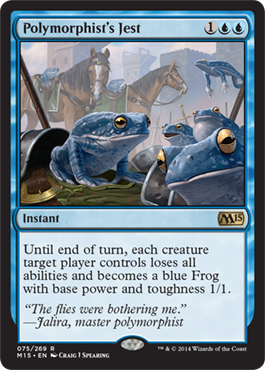 Eric's Review - Better than Turn to Frog (which is coming up later) all creatures a particular player controls lose every ability and become 1/1 blue frogs. Bottom Line: A great card for control and/or mass removal. It's good for EDH, Limited, and Standard. It is also possible that it is good in Modern. 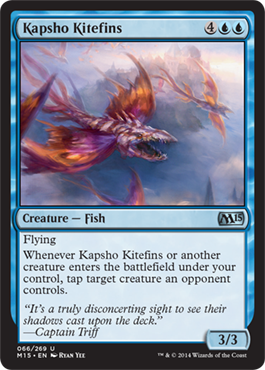 Eric's Review - A two mana 2/2 with flash and flying is great, but it does force the return of another creature to your hand.It's not too great of a card, but it can work in a pinch, especially with other cards with "Enter the Battlefield" effects. Bottom Line: Decent in Standard, good in EDH, and possibly good in Limited. 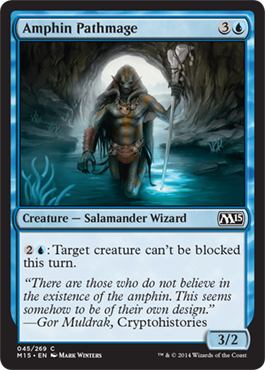 Eric's Review - Yet another Wizard creature, this is a 1/3 for two mana which isn't great, and it also has an ability that for four mana, you can draw and discard a card. Bottom Line: It really isn't that great, but is better for Limited than anything else. 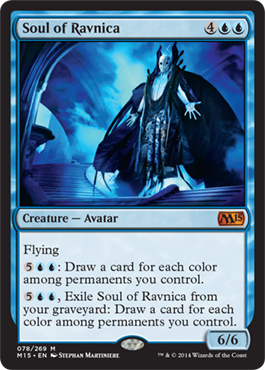 Eric's Review - Ah, Soul of Ravnica, a 6/6 for six mana with flying. For seven mana, you get to draw cards for each color of permanents you control, so it isn't too great unless it is in a deck with five colors when there are other cards that can draw two or three cards for much less mana. You can also exile Soul of Ravnica from a graveyard with a similar ability for the same effect. Bottom Line: Probably the worst of the five Souls, it would be a ton better if its ability cost a little less. Best for EDH, but could provide a serious leg up in Legacy. Eric's Review - Another card draw spell attached to a counterspell, but the card draw requires a blue creature, and you then have to discard a card. Bottom Line: Possibly good for Limited, might be good for Standard with Jace, the Living Guildpact. Eric's Review - Another reprint, Stormtide Leviathan will come in handy for the squid tokens as it makes all other lands islands. 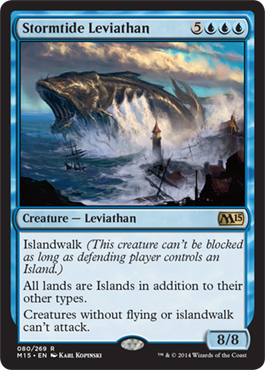 It also prevents non-flyers and creatures without islandwalk from attacking. 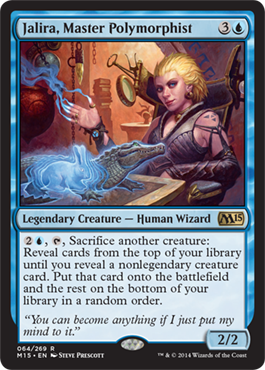 Bottom Line: While still a high costing, it could be used in a control deck in conjunction with the blue squid tokens, so it is plausible in Standard, a strong possibility in EDH, and Limited. Eric's Review - A lower powered version of Polymorphist's Jest, it was last scene in M12 and is good for spot removal as you can easily block and kill small 1/1 creatures. Bottom Line: Good in Limited, likely good in Standard, and a descent card in EDH. Eric's Review - While it can be better than Unsummon as it can return any nonland permanent to its owner's hand, but Void Snare is a sorcery unlike Unsummon. Bottom Line: Decent for control decks. Likely to see play in Standard, and also in Limited, not sure about EDH at all. 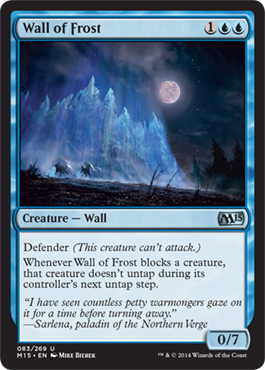 Eric's Review - Wall of Frost has returned from M14 as a 0/7 for three mana but when it blocks any creature, it can keep creatures from untapping during their owner's next untap step. Bottom Line: A decent card to have in Limited and Commander, but it isn't too amazing a card for Standard. Probably suitable for more budget decks. 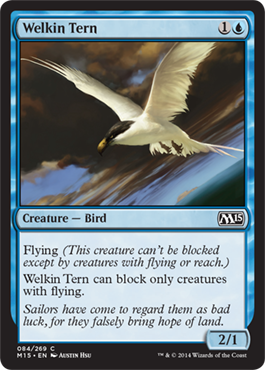 Eric's Review - Last seen in M13, this is a flying 2/1 for two mana. 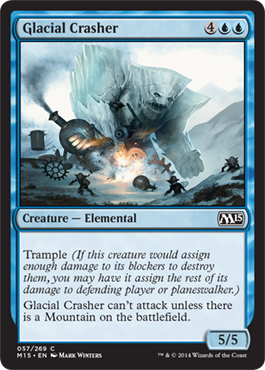 It has the downfall of only being able to block flyers, but this is still a decent card for budget decks and Limited. Bottom Line: Limited mostly, could be decent in Standard.